New Zealand’s infamous hour of binge-drinking, known as the ‘6 o’clock swill’, finally came to an end 50 years ago this October. 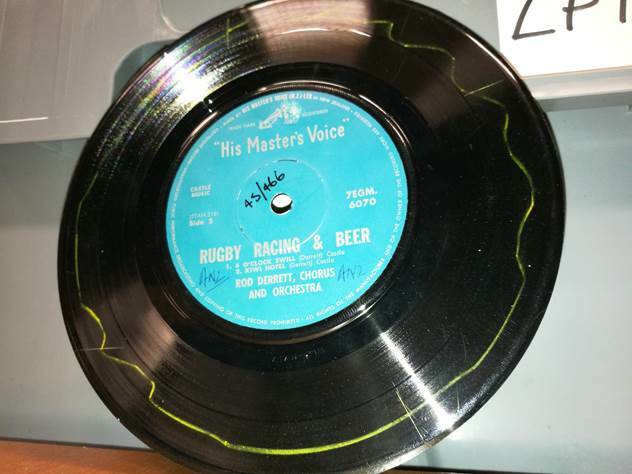 Recordings held in the sound archives of Ngā Taonga Sound & Vision tell us more about this unique approach to alcohol licensing, which was introduced during World War I – but endured for a further 50 years. 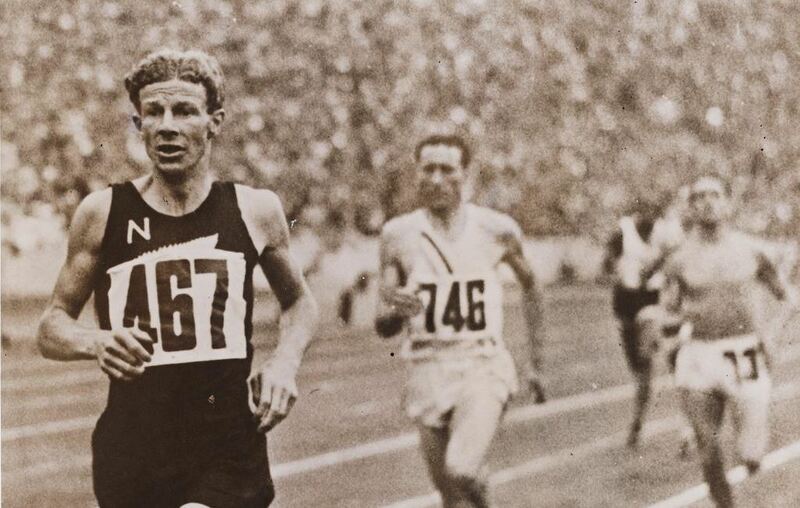 You can hear Sarah Johnston talk to RNZ’s Jesse Mulligan about these recordings, or read more and find links to the full recordings below. 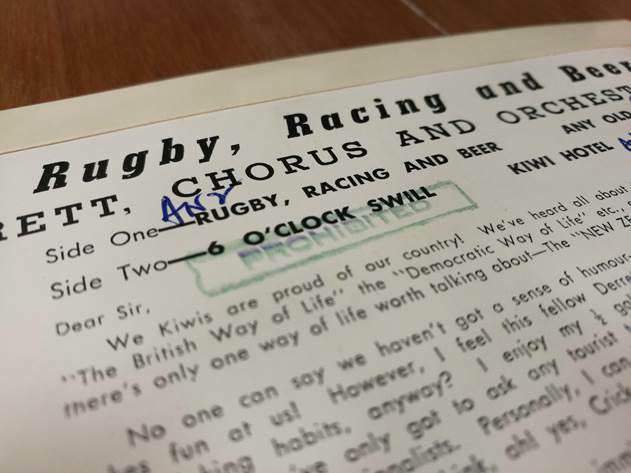 The ‘6 o’clock swill’ was the common name for the hour in which most New Zealand workers had to fit in all their drinking, between finishing work at 5pm and the pub doors closing at 6pm. 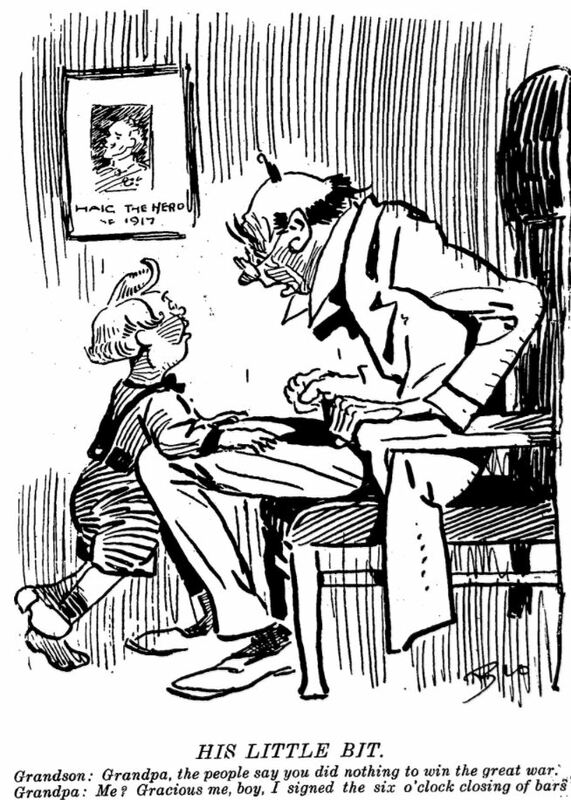 This was the licensing law from December 1917 until the law was repealed in October 1967. It meant crowded, noisy bars full of (mostly) men, hurrying to get as many beers in as they could, before “Time please, gentlemen!” was called at 5.45 and they were turned out onto the street at 6pm sharp. The law forcing hotels to stop serving alcohol at 6pm was introduced during World War I. There was a strong Temperance movement in New Zealand from the late 19th century onwards, with many people – especially women, pushing for total prohibition on the sale of alcohol, after seeing the effect unregulated drinking had on colonial society. Several Prohibition referendums were held and came very close to passing. Campaigners cited ‘the war effort’ as yet another reason why alcohol sales should be limited, arguing that sober workers would be able to produce more and concentrate the country’s energies on winning the conflict. The move to introduce 6 o’clock closing for bars in 1917 was a compromise by the government, to appease the groups pushing for Prohibition, but not shut down the liquor industry altogether. Soldiers returning from the war however, were not impressed to see what had been done to drinking laws in their absence, as veteran Jack Archibald of Nelson recalled this excerpt from a radio interview. 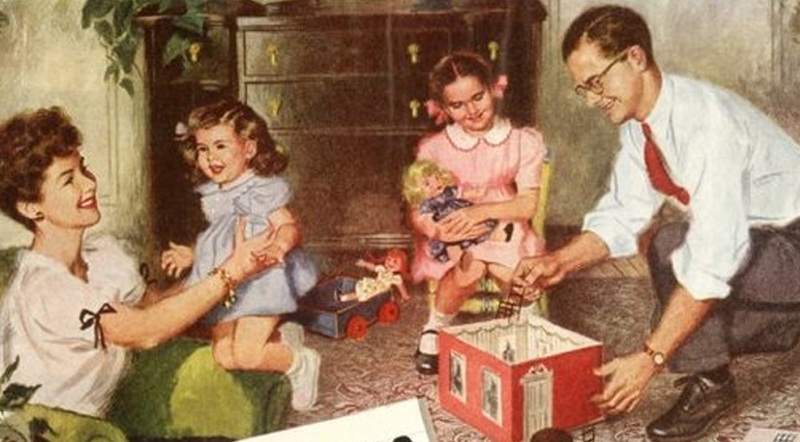 But the war-time measure became permanent and enjoyed some degree of popularity, remaining largely unchallenged through the 1920s, the Depression and World War II. 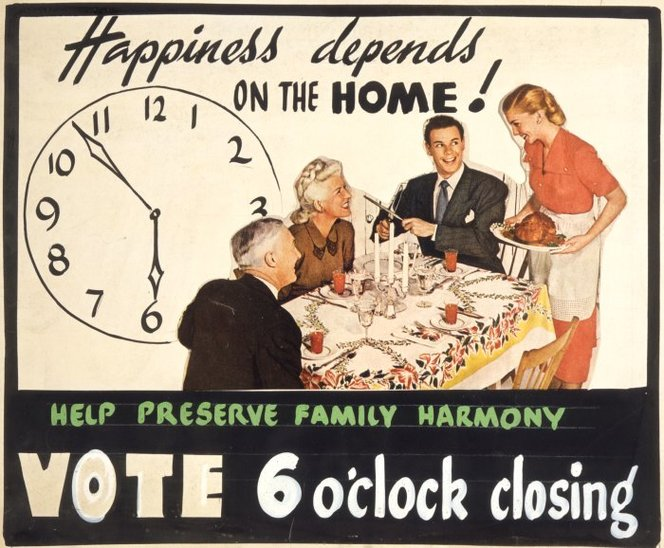 A referendum on whether to abolish early closing was held in 1949 – but nearly two-thirds of voters voted to keep 6 o’clock closing in place. 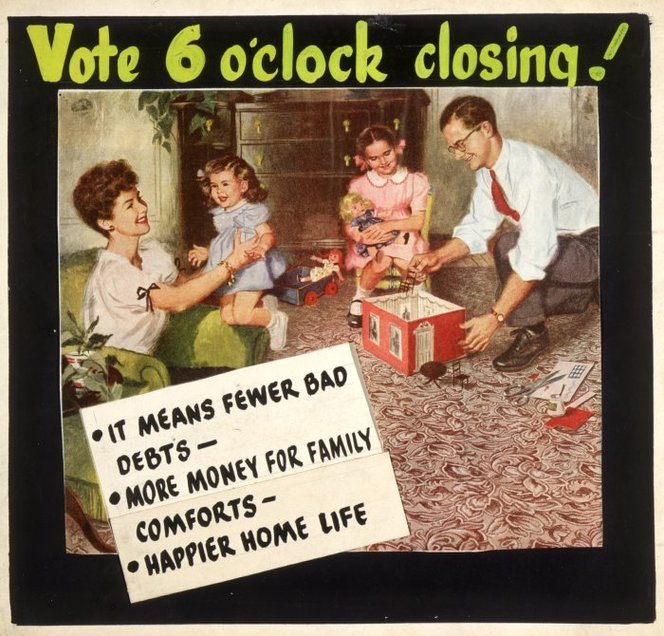 Those in favour argued that it meant men went home to their families after work, rather than spending their time – and their family’s income – in hotels, as these advertisements from the referendum campaign illustrate. Many New Zealanders in the documentary express concern about the high level of drunkenness among bar patrons who are forced out onto the street when pub doors shut at 6pm, after drinking as much as they can in a short space of time. They talk of a desire for more leisurely drinking – and for hotels to be a more pleasant environment where “a man can take his wife” – the jostling, beer-soaked ‘6 o’clock swill’ being seen as no place for a woman! 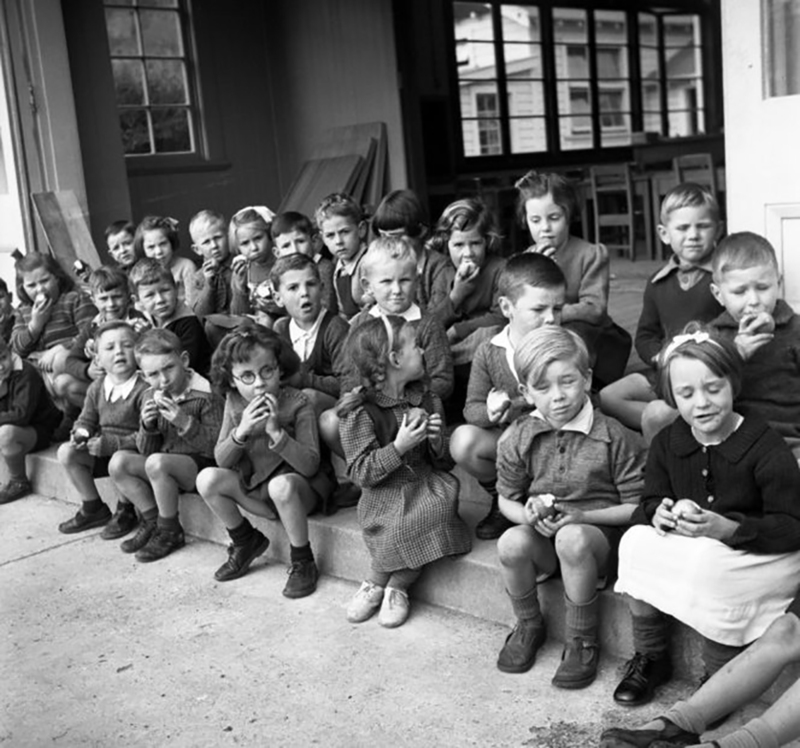 By the late 1950s New Zealand was becoming more cosmopolitan, with post-war migrants arriving from places like The Netherlands with a far more relaxed approach to alcohol. Restaurants were becoming more common and interviewees in the programme ask why they should not be able to enjoy a glass of wine with their meal? Overseas tourists too were increasing in numbers – and presumably were baffled by our strange regulations around drinking. Two years after this song was released another referendum was held, in September 1967. This time the majority vote was to extend licensing hours until 10pm and the 6 o’clock swill passed into the history books.